Let’s put young people first! They are the future and will soon become our leaders, teachers, entrepreneurs and parents themselves. If, and only if, we give them the support they need now! 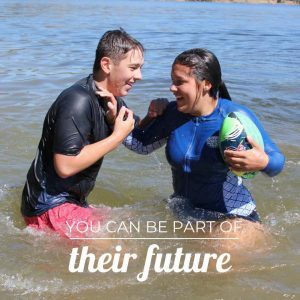 I am writing as the end of financial year approaches because Young Life Australia needs your help to reach our goal and budget for the year. Every week we see the benefit of adults making a positive, consistent investment in young people finding their way. Like Ange, who faced overwhelming anxiety at a vulnerable time in her life; and Sam, who struggled to find his voice and the confidence to speak*. Young Life has always focused on the importance of building confidence and helping young people develop their resilience. Our young adult leaders commit to being present and encouraging as well as honest and challenging. I am so proud of the Young Life team. Thank you for generously giving toward the work they do and sharing the journey with us. *We hope you find these stories encouraging but we’ve changed names to maintain privacy. I came to Young Life through Young Lives when I was four months pregnant and a long way from friends and family. There, I found unconditional friendship and acceptance. It was the only thing that got me out of the house in my first few months as a mum. Young Life has helped me find my way back from anxiety and reconnect with my faith. I feel like I’m not a mistake. I’m loved and I want to give back. I grew up thinking my story wasn’t important. When I was going along to Young Life, what really stood out for me, was when a leader would share their testimony. This was so valuable to us as kids. Especially for me. I definitely see worth and value in myself as a young person because of Young Life. The respect I felt from all the leaders was amazing and encouraged me to help other kids find that as well.